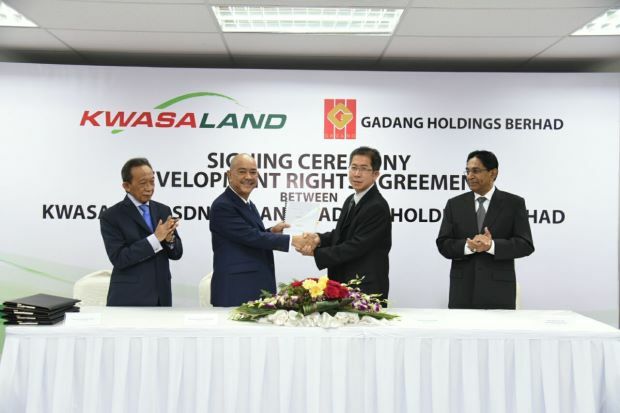 Kwasa Land Sdn Bhd will receive RM165.5mil for the development rights and revenue sharing from Gadang Holdings Bhd for a property development project at Kwasa Damansara township. Kwasa Land, which is the master developer of the township in Sungai Buloh, had on Tuesday signed an agreement with Gadang's unit Elegance Sonata Sdn Bhd for the development rights of the plot known as R3-1. It said 780 residential units comprising high rise towers and villas are to be built in R3-1, a 21.08 acre freehold plot. “R3-1 is projected to have a gross development value of approximately RM700mil,” it said. Signing on behalf of Kwasa Development (3) Sdn Bhd was Kwasa Land managing director Datuk Mohd Lotfy Mohd Noh while signing on behalf of Elegance Sonata Sdn Bhd was Gadang Holdings property division managing director Datuk Ling Hock Hing. Also present were Kwasa Land chairman Tan Sri Samsudin Osman and Gadang Holdings chairman Tan Sri Dr Mohamed Ismail Merican. Kwasa Land said the development plot fronting a 28.91-acre park is complemented by a 13.64-acre lake. It is near a town park, proposed schools, and commercial development plots. The development is accessible through Persiaran Atmosfera and will in the future be connected to the Guthrie highway. The development period would be six years for the entire project to be completed. Plot R3-1 is expected to be launched by January 2019. Two MRT stations within the development have been completed and are already in operation. These would provide premium value for property development in Kwasa Damansara as they are 500 to 700 meters from Kwasa Damansara station and the Kwasa Sentral station.